I’m in Cambodia, where I just finished a series of speeches to civic groups on some of my usual topics, in this case tax policy, the recipe for growth, and libertarian principles. All that was par for the course. 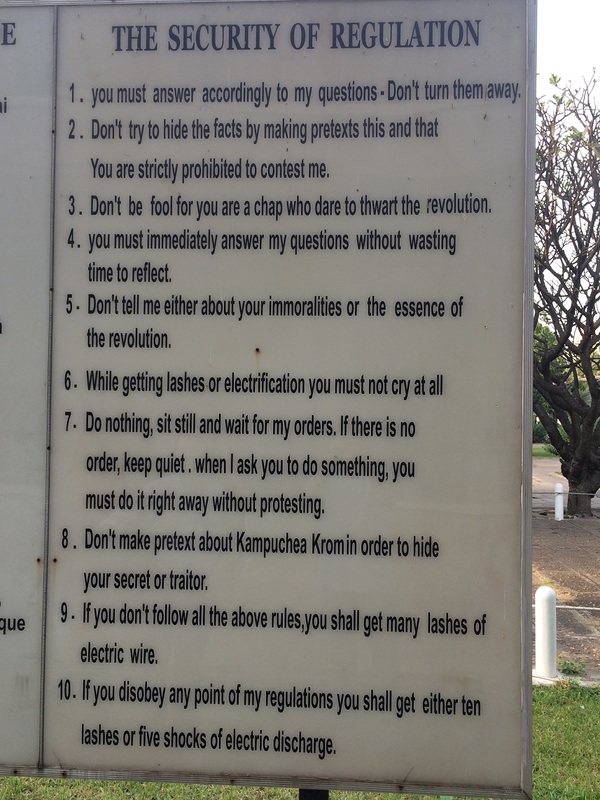 What will always stay with me and haunt my thoughts, by contrast, was my visit to the Tuol Sleng camp, which was used as a processing center during the genocide carried out by the Khmer Rouge communist dictatorship in the late 1970s. The bottom line, as you can see from this sign, is that 14,000-20,000 civilians went through this facility and only about 200 survived. Here’s a sign showing the English translation of rules governing camp behavior. The sixth rule, which says prisoners could not make noise while being beaten and tortured, seems especially perverse. Wow, reads like the rules governing campus anti-free speech tribunals. But I shouldn’t joke because so much of this camp contains horrifying memories of communist barbarity. 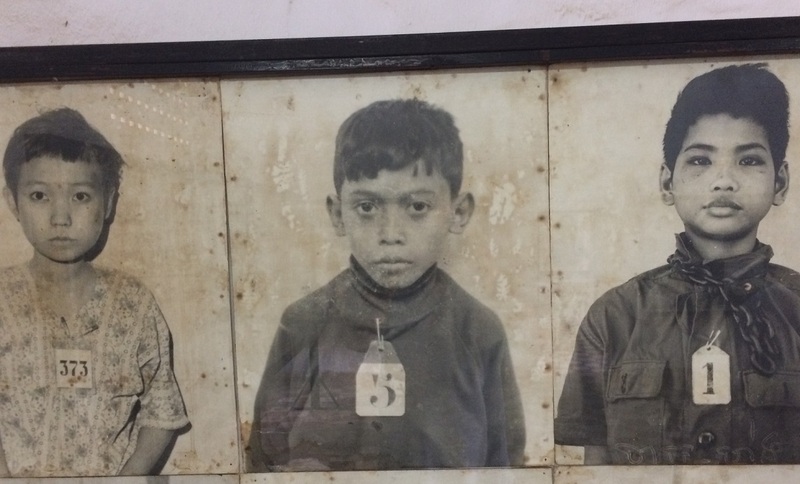 Here you see some of the children who were processed through this death facility. For some reason, this pile of clothes taken from butchered prisoners was very powerful. Keep in mind that this big pile of clothes is actually a drop in the bucket. 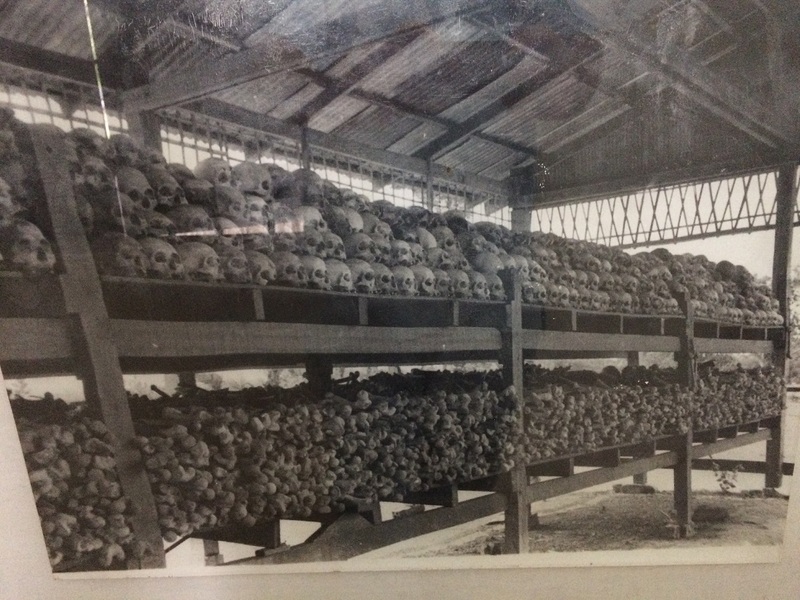 During the few years the Khmer Rouge was in power, the communists slaughtered at least 2 million out of a total population of less than 8 million. 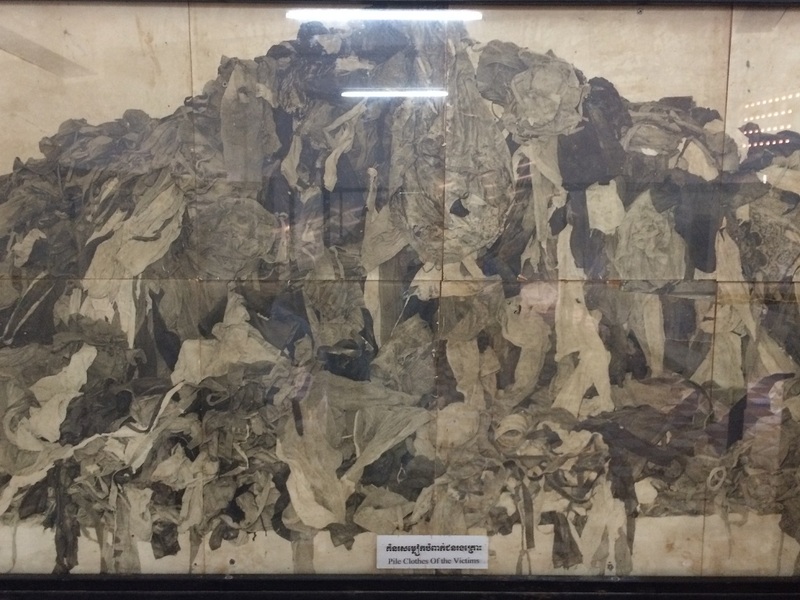 But if a mountain of clothes is too abstract, how about this pile of bones at one of the nearby killing fields where Tuol Sleng prisoners were taken for the Cambodian version of the final solution. As I toured this somber death camp, I couldn’t stop myself from thinking about the jerks who wander around in “Che” t-shirts. Yes, I realize that butchery by Castro’s regime was minor compared to what happened in Cambodia, but Cuba nonetheless has been a brutal police state. And Che was one of Castro’s murderous enforcers. How can any decent human being wear a t-shirt designed to portray him, or the regime, in a positive fashion?!? P.S. Let’s shift to a much lighter topic. 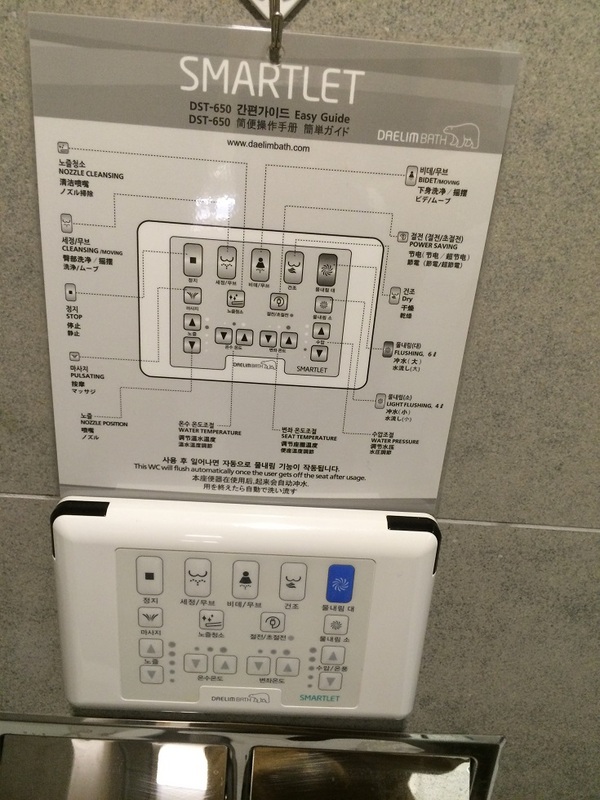 Back in 2012, I wrote about being flummoxed by a fancy toilet in Switzerland. It had all sorts of fancy controls, yet I couldn’t get them to work. Well, I was in Seoul, South Korea, a few days ago for a different speech and something similar happened. I checked into my hotel late in the evening, and went to …err… use the facilities before going to sleep. 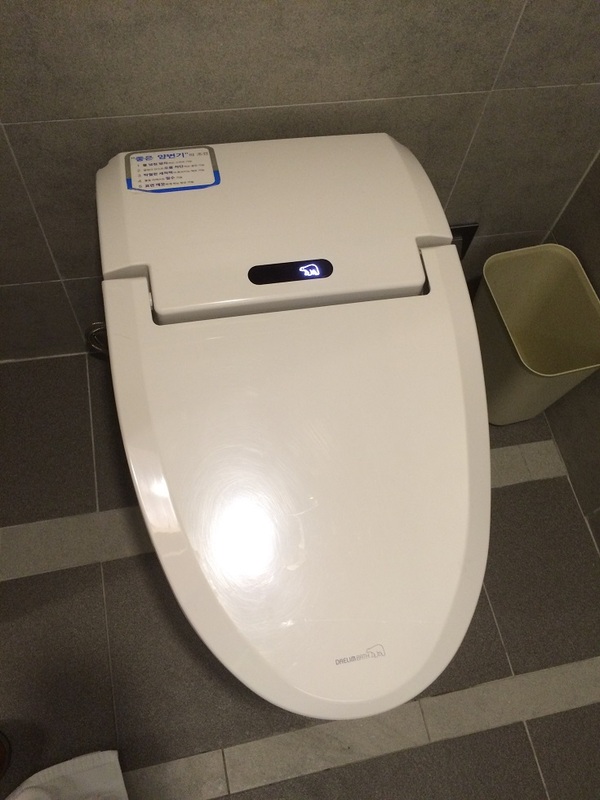 Lo and behold, I found a toilet with no flushing mechanism. No handle. No button. No pedal. Nothing. It was late, so I didn’t give the matter too much thought. I simply went to sleep and pretended I was a water-conserving environmentalist. The next day, though, I was more determined to figure out how to flush the toilet. My Ph.D. has to be good for something, after all. And that’s when I noted this set of instructions posted above the toilet paper. You’ll be happy to know that I eventually figured out the purpose of most of the buttons. Indeed, later in the day when I …um… well, let’s be delicate and simply say I issued an executive order, I even was able to activate the automatic hands-free wash and dry system for one’s backside. It’s remarkable what capitalism is capable of producing. P.P.S. Let’s return to the dour topic of government-imposed genocide. If you’re curious how the Khmer Rouge in Cambodia rank compared to other evil regimes, they only killed a tiny fraction of the death toll achieved by the Soviet Union and Maoist China. But if you’re scoring on a per-capita basis, the communist killers in Cambodia arguably might be at the top of the list. Next time I see some despicable jerk wearing a Che t-shirt, I think I’ll ask whether he has the matching Pol Pot version. I’m quite sure that the brainless kid won’t even know that Pol Pot was the dictator who presided over the Cambodian genocide, so my snide comment will fall on deaf ears. But maybe, just maybe, the kid will go online, learn about the profound evil of communism and throw Che in the trash. Heck, the morons at Mercedes-Benz were shamed out of using Che as a marketing gimmick, so there is hope! You lie, communism was and is a liberating force for good. Khmer Rouge was not communist, they were clients of the US Empire. How many did your capitalism killed? You should use the word socialism instead of communism. It is socialism, not communism. it was the Union of Soviet SOCIALIST Republics (not Communist Republics). This also will enable you to include (and educate people about) Germany under Hitler and the fact that they called themselves SOCIALISTS. They did NOT call themselves nazis, nor fascists. This kind of stuff cannot be said often enough. I will send it far and wide. Thanks. 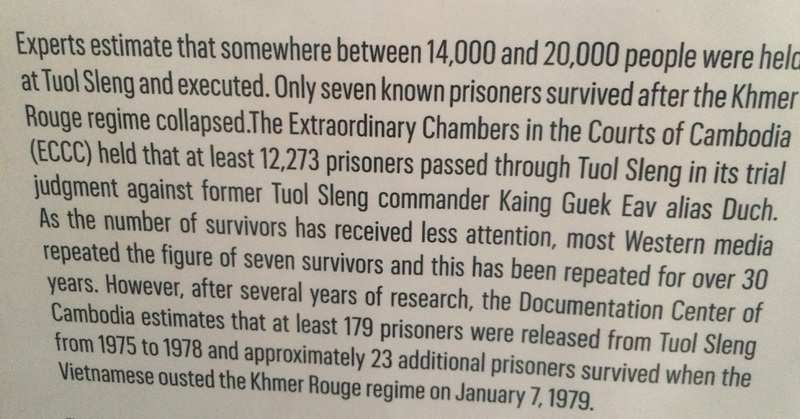 Hey, I just wrote about Tuol Sleng and Choeung Ek earlier today. I had not read the 200ish prisoners released sign. I know it pales in comparison to the vast number of those killed, but it makes stats ever-so-slightly less grim.